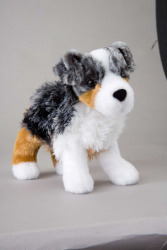 This Steward Australian Shepherd is so cute! Made by Douglas Cuddle Toy. A very realistic look pup! An excellent gift for the person in your life who loves dogs!